The iPhone has quickly become one of the most popular phones on the market, and most of the companies that build smart phones have scrambled to try and keep up with Apple. There are many phones that have been released to compete with the iPhone, and many of the phones have actually provided solid competition for the #1 smart phone. The Asus Padfone 2 is a device that will be released as another competitor for the top spot, and it definitely looks like it has a chance of taking back some of the market that Apple is currently dominating. Processor – The CPU in the iPhone is a 1.3 GHz A6 processor, running a dual core and using a top notch graphics card. However, the Asus phone features a 1.5 GHz Qualcomm Pro Quad core CPU, which means that it will run a lot faster than the Apple CPU. Storage Space and RAM – The RAM of the Asus phone has double the RAM that the iPhone 5 does, which means that it will run a lot faster when paired with the faster CPU. It comes with the exact same storage options that the iPhone has, but you will be able to store up to 50 GB of content on the Asus WebStorage for as long as 2 years. Display – The iPhone’s display has always been top of the line, and the iPhone is no different. Their phones are best not always in terms of specs, but the quality and brightness of their screen is legendary. The iPhone screen size is now 4 inches wide, and it has an 1136 x 640 resolution with 326 PPI. The Asus phone has a screen 4.7 inches wide, and is has a slightly better resolution of 1200 x 720 but just 312 PPI. Camera – Apple’s cameras have been considered the best since they were first released, and the camera on the iPhone 5 got a major upgrade. The rear camera offers 8 MP with an LED flash, along with dozens of useful features that you can’t find on most smart phones. The front facing camera shoots at 1.2 MP but in 720p video. The rear-facing camera on the Asus phone is up to 13 MP, and it too has the LED flash and many of the features offered by Apple. It has the same front-facing camera quality, but it will allow you to record video in up to 1080p – also known as full HD. Connectivity – The Asus phone has almost exactly the same connectivity options that the iPhone 5 does, including Bluetooth 4.0, WiFI networks, and headphone jack. The only difference is that it offers USB 2.0 connection, while the iPhone offers its proprietary connector. Operating System — The iPhone 5 runs Apple’s latest OS, which has proven to be quite excellent in many aspects. The Asus phone runs on an older Android OS, but it will be upgraded to Android 4.1 Jelly Bean in the very near future. Size and Weight – The iPhone 5 is slimmer than its older companions, which means that it’s lighter and sleeker than ever. It is a bit smaller than the Asus Padfone 2, and it weighs about 25 grams less. 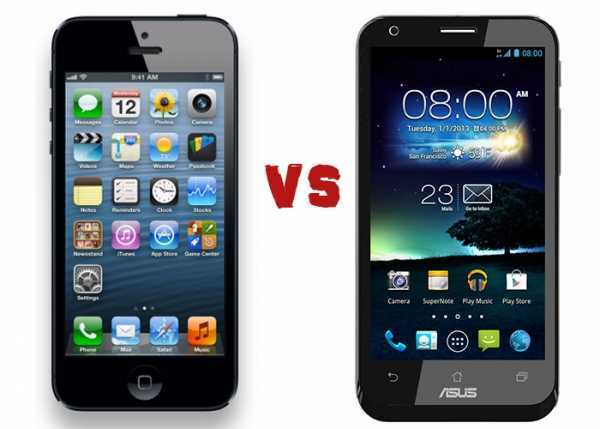 The truth is that the new Asus phone will definitely provide good competition for the iPhone 5, though there is much to be seen regarding whether or not it will be able to match up to the high quality of Apple’s iPhone 5. It has the potential, but there is still much left to see regarding its function and quality.